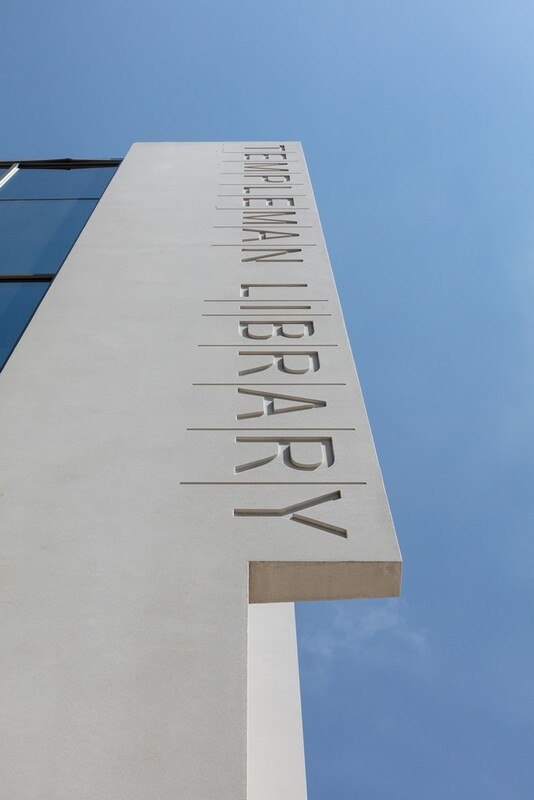 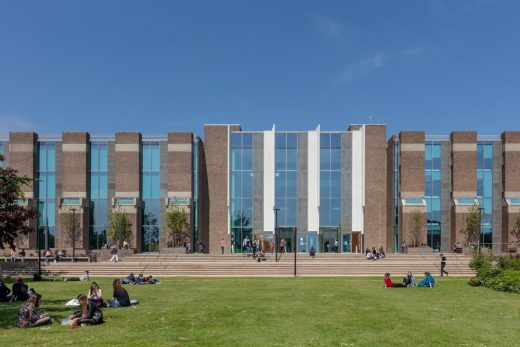 Through a major extension and refurbishment of the Templeman Library, Penoyre & Prasad have created a vibrant, contemporary building at the heart of the University of Kent’s campus. 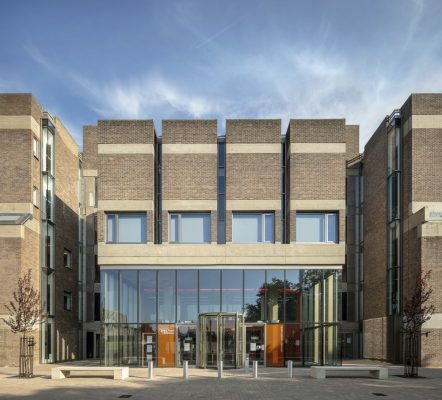 The existing library building was designed by Lord Holford and constructed in 1965. 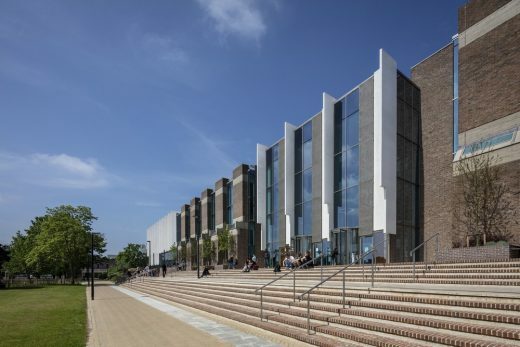 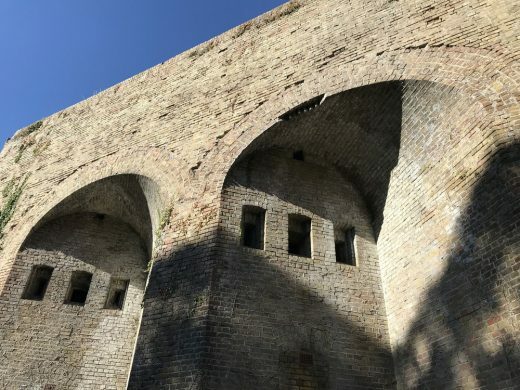 Its large concrete and brick structure is overtly expressed on the outside of the building and revealed as exposed concrete coffers at soffits within. 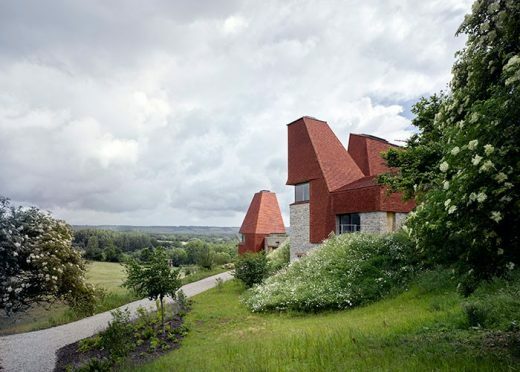 Penoyre & Prasad’s design solution has found a contemporary way to connect the old and new without pastiche. Ideas inherent to Brutalist architecture – an honesty of materials and the display of structure as an architectural element – were applied to the interior and exterior of the new building. Keeping the library open throughout the works significantly influenced the design approach and construction was phased to allow students and staff continuous access to study areas and collections. 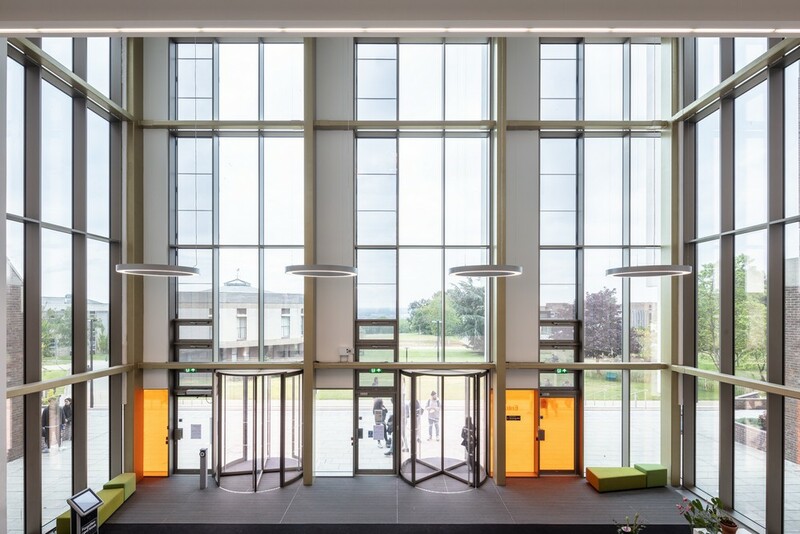 Holford’s original building lacked adequate space and an appropriate main entrance for the 12,000 students using it. 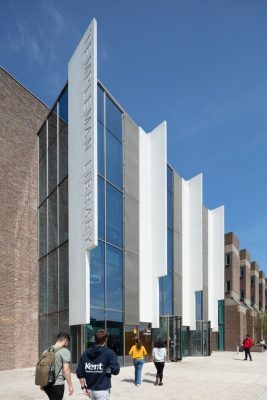 In design terms the regeneration of the 60s/70s era Brutalist building required a value for money upgrade that aesthetically lifted the building whilst also dealing with functional issues of poor accessibility and typical building defects of leaking roofs, ineffective heating and substantial asbestos. 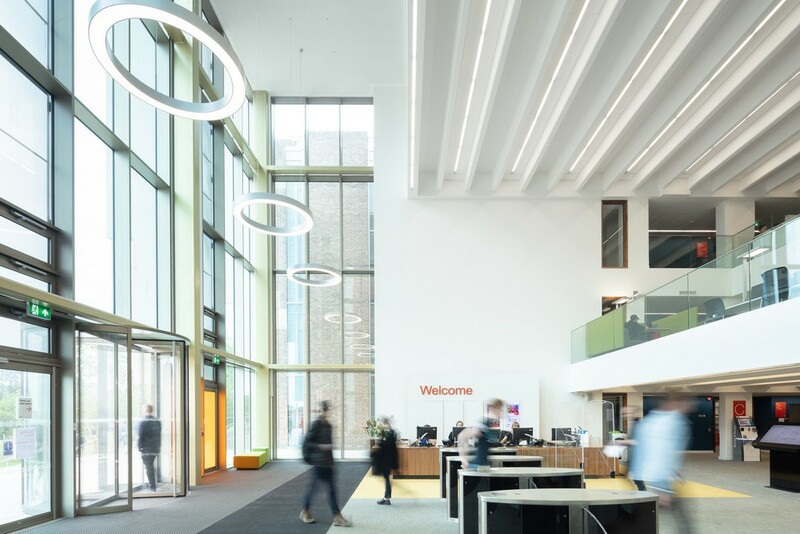 Existing glazing was replaced as part of the fabric upgrade, and functional issues of poor accessibility, internal wayfinding and maintenance issues were resolved. 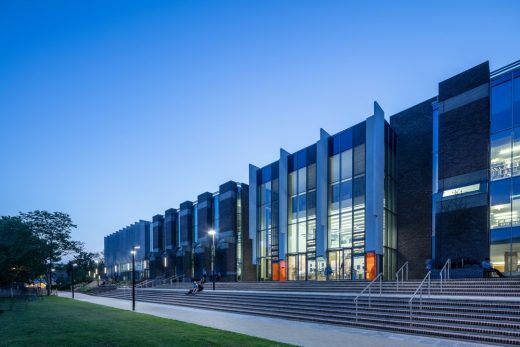 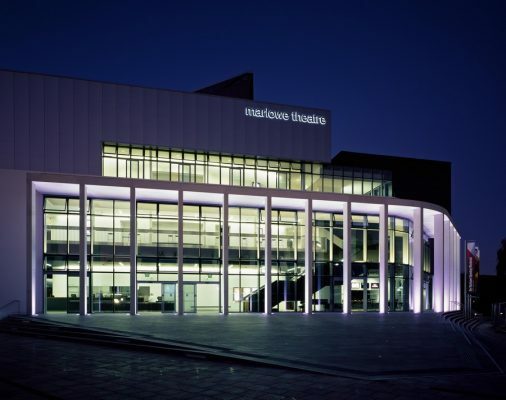 The external design solution uses precast concrete fins, bronze anodised curtain walling and mesh paneling to form the extension facade and fill the brick piers of the existing building. 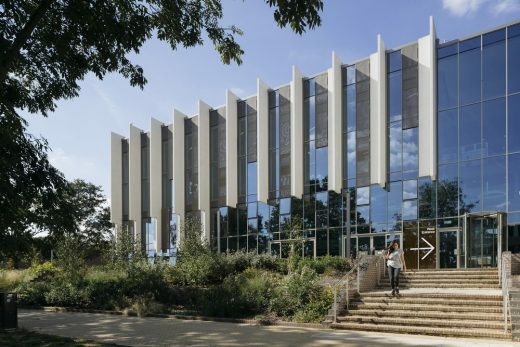 This attractive and sustainable envelope that weaves old and new together has created a single, distinctive flagship building. 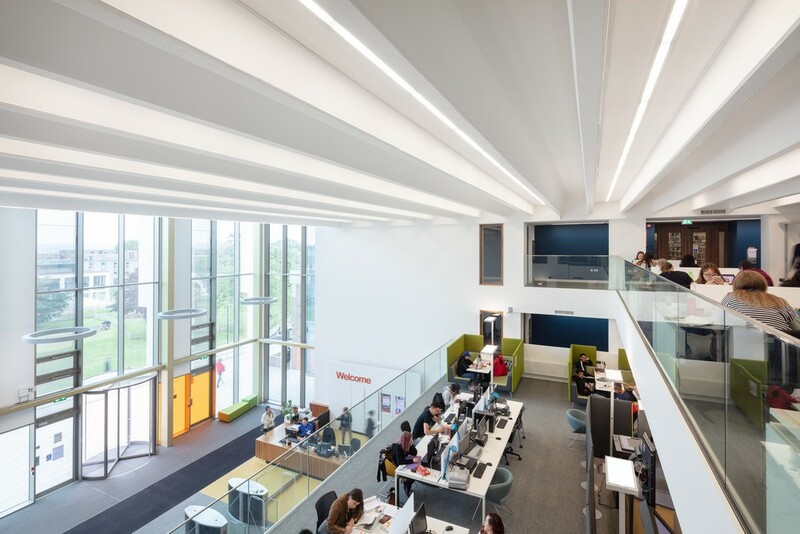 The interior refurbishment brings natural light into the deep building plan. 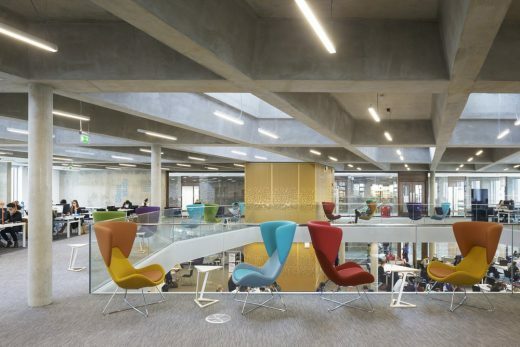 Circulation has been unlocked and enhanced, flexibility and energy efficiency have been improved, and a comprehensive renewal of the internal finishes have revitalised the interior to produce a vibrant contemporary library; re-emphasising its enduring and pivotal role in the university. 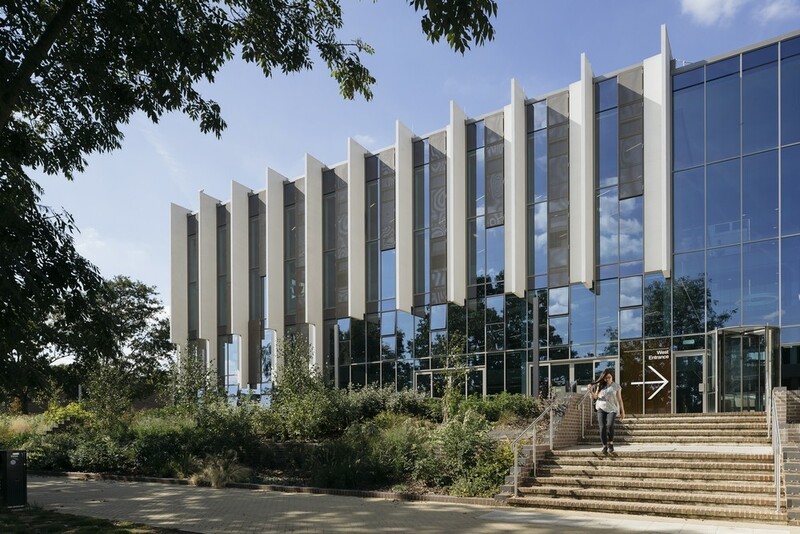 The 5,400 sqm new building extends the existing 12,500 sqm library to provide a 250-seat lecture theatre, seminar spaces and teaching suite, and exhibition, archive, conference, study and café spaces. 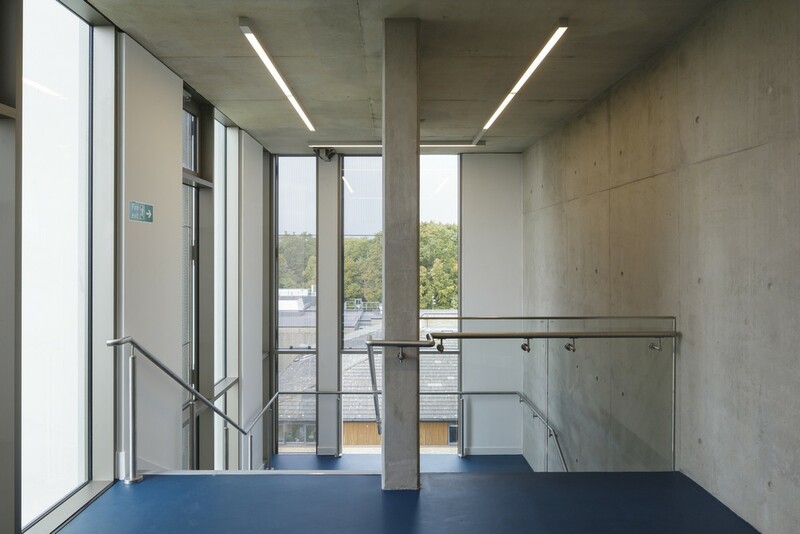 The extension is flooded with natural daylight providing students with stunning views over Canterbury. 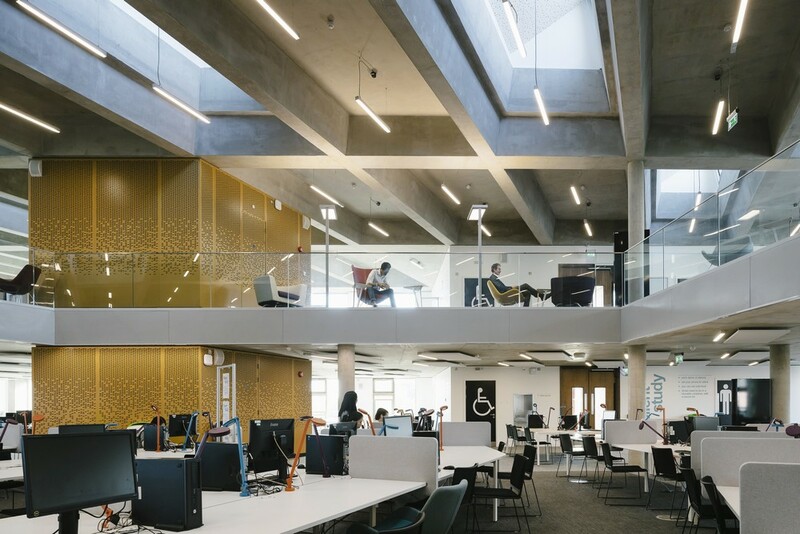 The structural grid of large concrete coffers at roof level provide a strong internal spatial dynamic relating to the spaces below. This in-situ frame with raised access floors provides maximum future flexibility in lighting, natural ventilation, power distribution and compartmentation. Externally, pre-cast concrete fins of the new extension and new entrance pick up on the language of the existing building in an elegant and refined way. 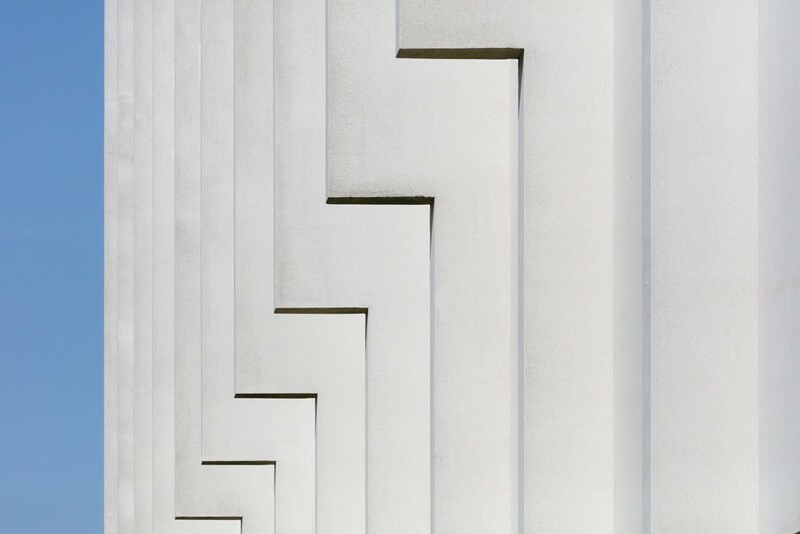 The vertical rhythm of the original building piers is repeated through the frequency of the fins, however the weight of the original building and its horizontal lines are inverted through raising the fins off the ground. The shift to the vertical instead of horizontal rhythm allows the building to feel as one whole and enables the new extension to stand its ground, avoiding it feeling like a poor appendage to the original building. 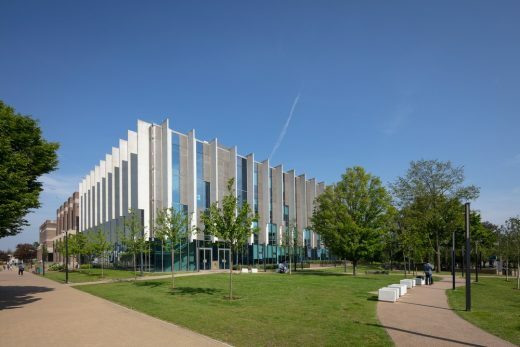 The use of concrete is an important component of the building’s sustainability measures. 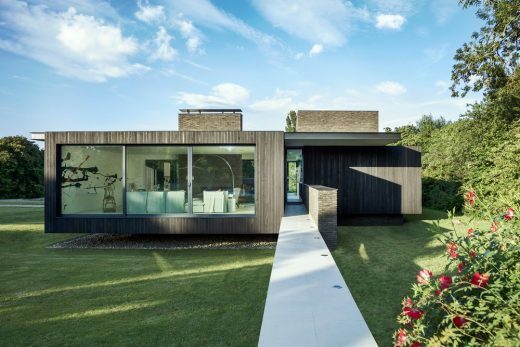 The insitu concrete frame is exposed at soffit level throughout the extension creating thermal mass which teamed with opening windows enables night-time cooling. Below ground concrete pipes provide passive cooling to the centrally located lecture theatre allowing it to operate as a mixed mode ventilated space – this is quite an achievement for such a large internal space. At the façade, the pre-cast concrete fins provide shading to produce a comfortable interior environment and avoiding the need for active cooling systems. A new landscaped, raised entrance podium improves accessibility and provides a civic place for students. 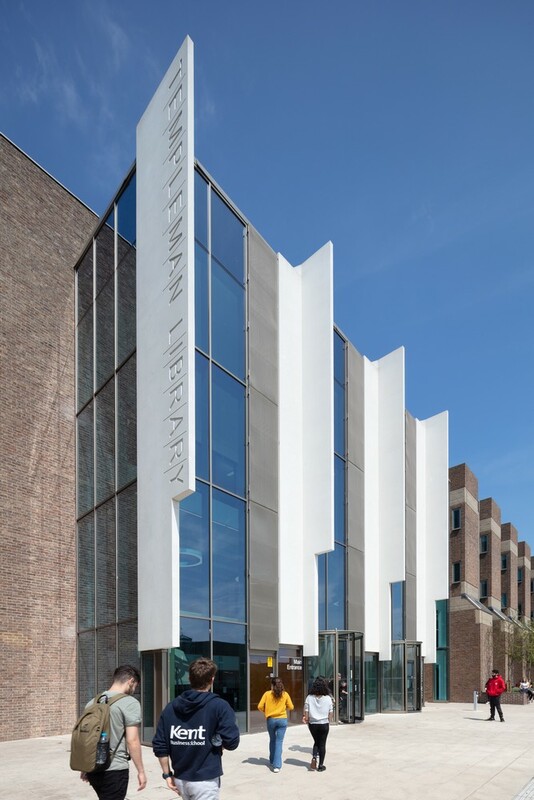 Improvements to the north of the building create a cultural ‘avenue’, linking with nearby theatre and school of architecture.